(a) Start the engine and visually check if the fan of the generator rotor assembly located inside the generator assembly is operating. The fan of the generator rotor assembly is operating. (a) Remove the generator assembly (See page ). 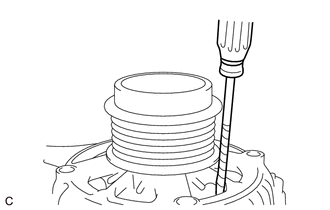 (b) Check the installation condition of the generator pulley cap. The generator pulley cap is not loose or missing. (c) Check for grease leaks (for wet pulley) or particle formation due to friction (for dry pulley). No grease leaks (for wet pulley) or large build-up of particles (for dry pulley). (d) Check the generator with clutch pulley for misalignment (interference with the generator assembly). The generator pulley with clutch is correctly aligned (no interference with the generator assembly). (e) Turn the generator pulley with clutch clockwise and counterclockwise by hand and check for noise. Noise does not occur when turned in both directions. 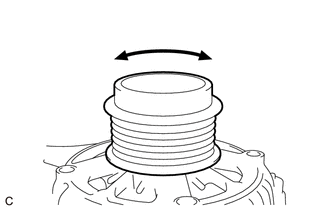 (f) Turn the generator pulley with clutch clockwise and counterclockwise by hand and visually check for runout. The generator pulley with clutch does not have runout. (g) Using a screwdriver, hold the fan of the generator rotor assembly located inside the generator assembly in place and check that the generator pulley with clutch locks when turned clockwise and turns freely when turned counterclockwise. The generator pulley with clutch locks when turned clockwise and turns freely when turned counterclockwise.